I love eating in the summer. Well, I love eating any time, but I love eating fresh foods from my garden and that all the veggies are cheaper. 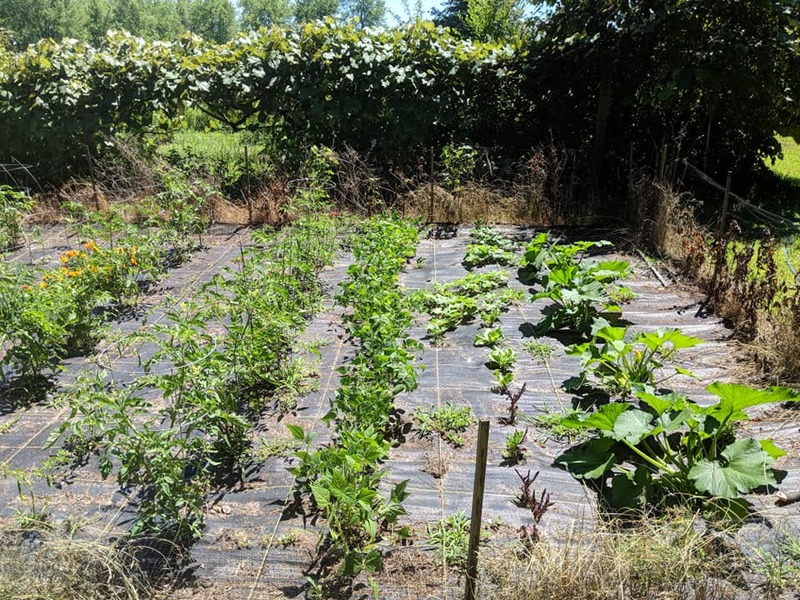 We have been eating a TON of zucchini, cucumbers, green and yellow beans, and sweet corn lately! Soon we will add tomatoes to this list. Everything but the sweet corn has come from our back yard! We also tend to grill more in the summer and that is my favorite way to cook steaks and chicken! part of the garden in early July.. we've had about a week of rain now and everything is huge! I also have gotten to expand my zucchini recipe repertoire this summer because I have more time to invest in cooking and I am in charge of meals again! Some family favorites have been the zoodles I've made. 1. Use the spiralizer, put it in the colander, shake on salt, put it in the fridge. I've left it in there up to a few hours. Then I squeeze the water out. 2. In a pan melt butter, throw in some red onion. Cook a bit, then throw in a garlic, cook a bit. Then toss in the zoodles and warm them up. 3. YUM! I have thrown in a few sprinkles of parm cheese a few times. Also delicious. Another zucchini fan favorite was following this recipe for Parm Zucchini rounds! I threw salt on them in a colander and left them in a fridge for the afternoon and then squeezed out the excess water! I've also zucchini tots which are fave. My least fave way to eat them is grilled plain ha. 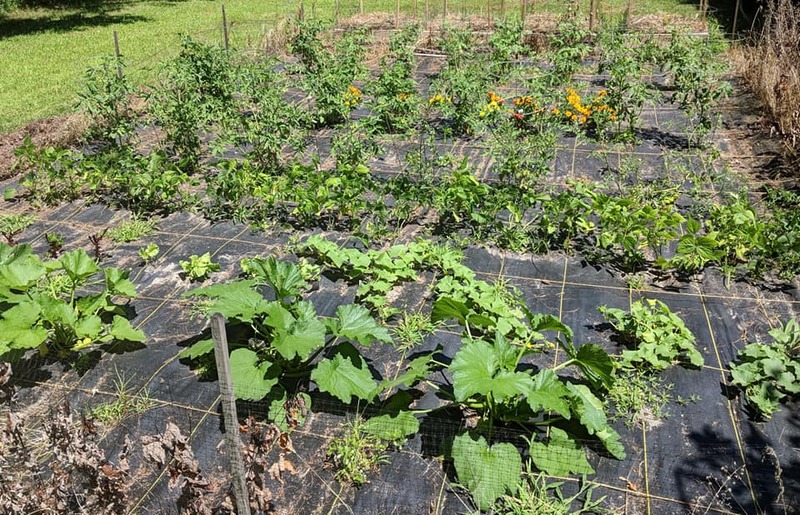 another view of the garden.. we have strawberries, raspberries,peach trees, apple trees and asapragus elsewhere.. you can't really see the blueberries at the end of this picture but we planted 4 this year to try again! For cucumbers, I've mixed them with equal parts vinegar and water, dash of sugar and some diced red onion. Yum! I do like to eat the plain or with a dash of salt. Green and yellow beans we made a green bean casserole one night that was a hit and besides that we've been just sauteing them with garlic, salt and pepper. Sweet corn has just been boil for about 20 minutes and then serve with butter and salt. Last night we had an excellent dinner. 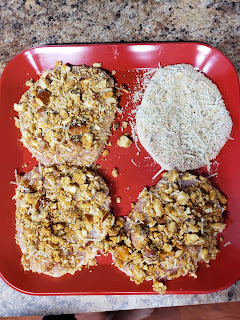 I made thin pork chops that I drenched in egg and then dipped in a jalapeno pretzel/parm mix. SOOO GOOD. We've made it a couple times like this and it's a win. We make the kiddos with a panko/parm mix and then I add the jalapeno pretzel mix into that with some more parm. You just need to make sure you smash up the pretzel good. But it gives it a great flavor. We inherited this bag of pretzels and they were almost just a bit too spicy on their own, but on the pork chops it's fabulous. before the pork chops were cooked up.. The pork chops were then served with green and yellow beans, parm zucchini rounds, cherries, and mac and cheese. So yummy! What have you been eating this summer? Any veggie recipes you swear by?